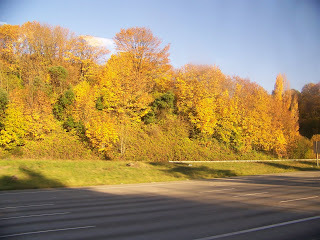 I love Autumn and I miss the autumns we had when I lived in West Virginia...many years ago. 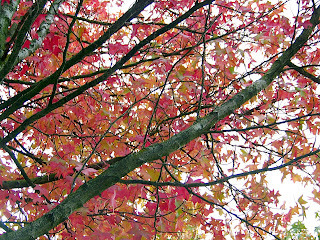 We actually don't have much in the way of Autumn colors here in our part of North Carolina this year. 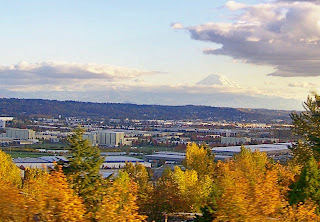 I had to go to Washington State to bring home some brilliant yellows and blazing reds. 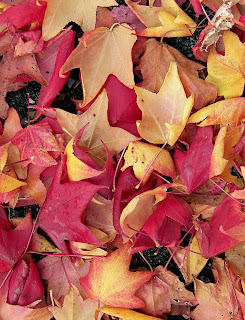 Hope you are enjoying this fall season wherever you might be - if not, enjoy my photos! 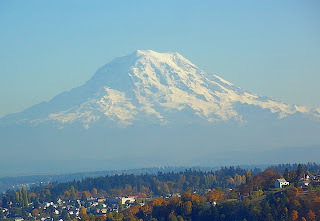 Mount Rainier, a spectacular, majestic active volcano, has the greatest single-peak glacial system in the United States consisting of several glaciers. At one time, Mt. 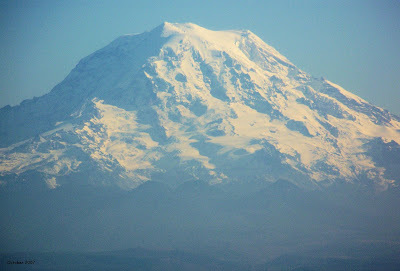 Rainer was probably 1000 feet above the present summit height which rises 14,410 feet above sea level. The upper portion of the volcano's cone was likely removed by explosions and landslides. This is the view from our hotel. How I would love to wake up to this view each day. ...and the RAIN came down!